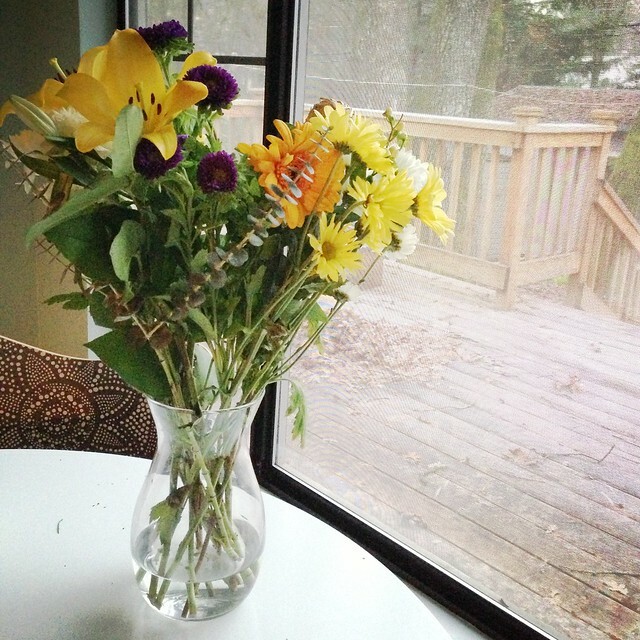 After I did my grocery shopping yesterday, I purchased flowers to replace the dying bouquet in my kitchen. 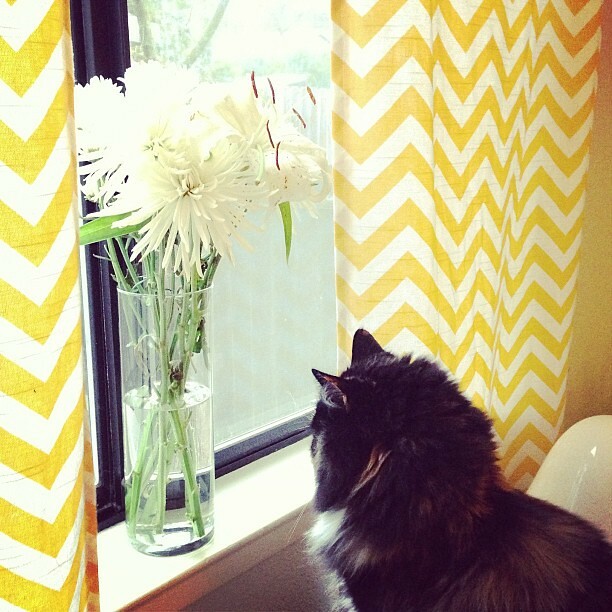 I managed to save a few from my old bouquet, and they are in a smaller vase in my office window. The whole house got a good vacuuming last night, which is really what it only needed because the weekend prior, Joshua and my sister help me vacuum and mop the floors. As for stocking up on green cleaners, I’ve basically got that covered. About 95% of my cleaning products are by Method. Not only are the well-designed, but their products work and are eco-friendly. I added items to my Outbox this weekend since I did some organizing in my office and guest bathroom. 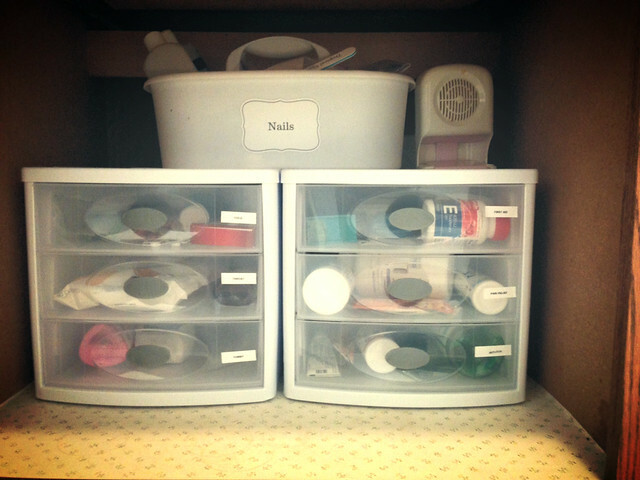 Thanks to this little gem on Pinterest I was able to clear out a box and some containers just by organizing. On the left, the drawers are Cold, Throat, and Tummy; on the right, they’re First Aid, Pain Relief, and Anti-Itch. So nice to have everything organized in one spot. That way if guests ever need anything I can simple direct them to the middle cabinet in the guest bath. I started doing some organizing in my office, which ties into today’s assignment: Find a spot in your home that you rarely sit in that gives you a view on a room or area that you feel is especially problematic and spend 10 quiet minutes there. My linen closet is right across the hall from my office, so while sitting on the floor going through items that made their way into my bathroom organization, I was able to see my office from a different perspective. My office hasn’t gotten a whole lot of attention because I crammed all of my scrapbook and computer-related items in there shortly after we moved. Then it became a catch-all for my gift-wrapping items right before Christmas. Needless to say, I want to make some changes. Good thing I added it all to my project list! I also rejoined Weight Watchers last week and went to my first meeting in several months. School and work made it very difficult to fit in other outside activities, but now that it’s just work, I can fit it in. It felt good to be going back to a meeting. Sunday: Homemade buffalo wings with skinny ranch dip. Monday: On my own. Trying out these Lean Cuisine Salad Additions. Tuesday: Broiled steak with a parmesan shrimp sauce, salad, and veggies.